Israeli society is constantly swerving to the right and, by doing so, the country’s entire political paradigm is redefined regularly. That Israel is now ruled by “the most extreme right-wing government in its history” has grown from being an informed assessment to a dull clich over the course of only a few years. In fact, that exact line was used in May 2015, when right-wing Prime Minister Benjamin Netanyahu formed his thin majority government of like-minded right-wingers, religious zealots and ultranationalists. The same sentiment, with almost the exact wording, is being infused again, as Netanyahu has expanded his coalition by bringing to the fold the ultranationalist Avigdor Lieberman. As of Wednesday May 25, Lieberman has also become Israel’s defense minister. Considering Lieberman’s rowdy and violent politics as demonstrated in his two terms as foreign minister (from 2009 to 2012 and, again, from 2013 to 2015), being a defense minister in Israel’s “most extreme rightwing government in history” harbors all kind of terrifying prospects. While many commentators rightly pointed to Lieberman’s past provocations and wild statements — for example, his 2015 statement threatening to behead Palestinian citizens of Israel with an ax if they are not fully loyal to Israel; advocating the ethnic cleansing of Palestinian citizens of Israel; his death ultimatum to former Palestinian Prime Minister Ismail Haniyeh, and so on — his predecessor, Moshe Yaalon, was spared much blame. Worse, the former defense minister, Yaalon, was regarded by some as an example of professionalism and morality. He is “well-regarded,” wrote William Booth in the Washington Post, compared to the “polarizing maverick” Lieberman. But ‘well-regarded’ by whom? By Israeli society, the majority of whom support the cold-blooded murder of Palestinians? Israel has adhered to its own definition of political terminology for a long time. Its early ‘socialism’ was a blend of communal living, facilitated by military onslaught and sustained by colonialism. Its current definition of ‘left,’ ‘right,’ and ‘center’ are also relative, only unique to Israel itself. Thanks to Lieberman — the former Russian immigrant, club bouncer-turned-politician who is constantly rallying the roughly one million Israeli Russian Jews around his ever-violent political agenda — Yaalon is now an example of level-headedness and morality. Yaalon took part in every major Israeli war since 1973, and his name was later associated with the most atrocious of Israeli wars and massacres, first in Lebanon and, later, in Gaza. His ‘morality’ never dissuaded him from ordering some of the most unspeakable war crimes carried out against civilians, neither in Qana, Lebanon (1996) nor in Shujayya, Gaza (2014). Yaalon refused to cooperate with any international investigation conducted by the UN or any other monitoring group into his violent conduct. In 2005, he was sued in a US court by the survivors of the Qana massacre in which hundreds of civilians and UN peacekeepers were killed and wounded in Israeli military strikes in Lebanon. In that case, neither Israeli nor American morality prevailed, and justice is yet to be delivered. Yaalon, who received military training early in his career at the British Army’s Camberley Staff College, continued to rise in rank within the army until 2002 when he was appointed chief of staff of the Israeli Defense Forces. He was in that post for nearly three years, as a result of which he ordered the assassination of hundreds of Palestinians and oversaw various massacres that were carried out by the Israeli army during the Second Intifada. His post was terminated by the then Defense Minister, Shaul Mofaz, in 2005. In this case, too, it was immorality, not morality, that played a role in the conflict between him and his superiors. Yaalon was — and remains — an ardent advocate for the illegal colonization of Palestinian land. In 2005, he vehemently rejected the so-called redeployment from the Gaza Strip, in which a few thousands illegal settlers were relocated to Jewish colonies in the West Bank. His war crimes caught up with him in New Zealand in 2006 — over the assassination of a Hamas commander, Saleh Shehade, together with 14 members of his family and other civilians. An arrest order was issued but revoked later, under heavy political pressure, allowing Yaalon to escape the country. The destruction of Shujayya, in particular, was a calculated strategy devised by Yaalon himself. In a July 2013 meeting with UN Secretary-General, Ban Ki-moon, Yaalon informed the UN chief that he would bomb the entire neighborhood in case of war. He did. 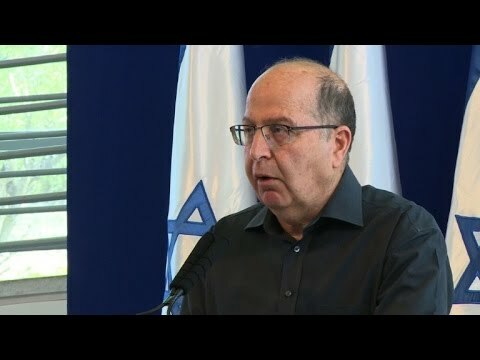 In his first public remarks since his resignation, Yaalon accused a ‘vocal minority’ in Israel of targeting the country’s “basic values,” stating that the country’s “moral compass” has been lost. The odd thing is that many Israelis agree with Yaalon. They see the man who has been accused of carrying out war crimes for most of his career as an example of morality and basic values. While Lieberman has demonstrated to be a loose cannon and a political liability, Yaalon has openly spoken of targeting children and repeatedly lived up to his promises. When the likes of Yaalon, a man with a blood-stained record becomes the face of morality in Israel, once can understand why the future of that country brings little hope, especially now that Lieberman has brought his Israel Our Home Party to Netanyahu’s terrifying nest of political parties.